July 6, 2013 - Asiana Airlines Flight OZ214, aircraft registration HL7742, which had originated from Shanghai China departed Incheon International Airport, South Korea on Friday 4:35 PM Korea time, bound for San Francisco. On Saturday at 11:36 local time, the Boeing 777 crashed while landing on runway 28L at San Francisco International Airport (SFO). Two passengers, teen girls, Ye Mengyuan and Wang Linjia, both Chinese nationals were killed. Their bodies were found lying next to burning wreckage. Five passengers are in San Francisco General Hospital in critical condition, and over 175 are being treated for injuries non life threatening injuries. Onboard were a total of 307 passengers with 16 cabin crewmembers. The majority of the passengers were comprised of 77 Korean citizens, 141 Chinese citizens, 61 US citizens, 1 Japanese citizen, origin of the other passengers are unknown at this time. A passenger on board said "It was all over in 10 seconds. We heard a big bang, and it was over." While landing on runway 28L, Flight OZ214 landed before the numbers and was to low. 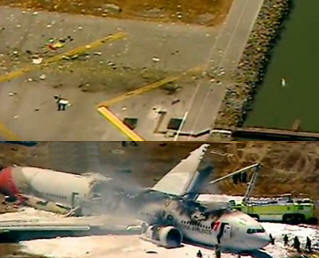 The aircraft tail hit the edge of the embankment, which separates the runway from San Francisco Bay. Asiana Airlines is one of South Korea's two major airlines. The carrier is headquarters in Asiana Town in Osoe-dong, Gangseo-gu, Seoul. Asiana Airlines has its domestic hub at Gimpo International Airport and its international hub at Incheon International Airport 43 miles from central Seoul. The captain of Flight 214 had been flying for Asiana since 1996, however, he only had 43 hours of flight experience in the B777-200, although he had significant flight time on other jets. Asiana Airlines spokeswoman Lee Hyo-min said "He is a veteran pilot with almost 10,000 hours on other aircrafts like the 747. He was in the process of getting a license for the new 777." The copilot had 3,220 hours of experience flying the Boeing 777. He was helping the captain with the landing when disaster struck. Asiana Airlines spokeswoman said (the captain) “He was training. “Even a veteran gets training (for a new jet). He has a lot of experience and previously had flown to San Francisco on different planes, including the B747 ... and was assisted by another pilot who has more experience with the 777." As Flight 214 was on approach for landing the aircraft alert system, “stick shaker” was activated informing the pilots that the aircraft was flying to low and that their airspeed was as well to slow. A stick shaker is a mechanical device to rapidly and noisily vibrate the control yoke (the "stick") of an aircraft to warn the pilot of an imminent stall. Representatives from the FAA and NTSB are investigating. The NTSB has ruled out weather as a problem and reported that weather conditions were right for a "visual landing." Data on the black boxes recovered from the jet showed that the pilots had learned the Boeing 777 was about to stall and the pilots tried to abort the landing just before it crashed. NTSB Chair Deborah Hersman said the pilots then attempted a "go around" to abort the landing, less than two seconds before the plane hit the runway. The NTSB is the lead investigative organization. In a statement released by Asiana Airlines, the company said it is currently investigating the specific cause of the incident as well as any injuries that may have been sustained to passengers as a result of the crash. Boeing said in a news release “Boeing extends its deepest condolences to the families and friends of those who perished in the Asiana Airlines Flight 214 accident in San Francisco, as well as its wishes for the recovery of those injured. Boeing will join the U.S. National Transportation Safety Board at their request to provide technical assistance to their investigation. In accordance with the international protocol governing aviation accident investigations, all inquiries about the investigation must be directed to the NTSB”. Update - July 12, 2013, The National Transportation Safety Board apologized for inaccurate and offensive names that were mistakenly confirmed as those of the pilots of Asiana flight 214. A summer intern acted outside the scope of his authority when he erroneously confirmed the names of the flight crew on the aircraft. The NTSB does not release or confirm the names of crewmembers or people involved in transportation accidents to the media. 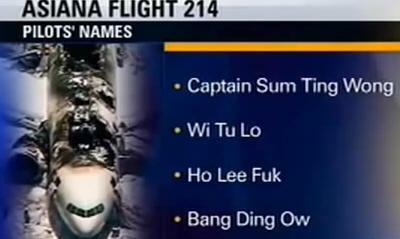 The student released such names as captain Sum Ting Wong, Ho Lee Fuk, Bang Ding Ow, Wi Tu Lo. KTVU TV apologizes for racist prank, but lawsuit possible. July 13, 2013, According to San Francisco General Hospital, another passenger who was aboard flight OZ214 has passed away this morning after having been hospitalized in critical condition following the accident. The hospital is respecting the wishes of the girl’s parents that no further information be publicly released at this time. With this regretful loss of life, the death toll of the recent Asiana crash landing has risen to 3. Asiana Airlines President and CEO, Young-Doo Yoon expressed his deepest sympathies by saying, “My deepest condolences go out to the grieving family and loved ones of this passenger and to all those who have been affected by this regretful incident. We will devote all attention and efforts to support the families of the victims and expedited recoveries for the other injured passengers”.